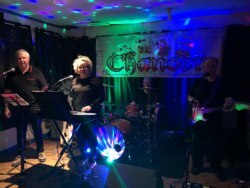 Chancer is a four piece band from Cornwall formed in early 2018 consisting of Helen (vocals/keyboards), Phil (guitar/backing vocals), Pete (bass/backing vocals) & Steve (drums/backing vocals). We have many years experience between us having been in various other bands & different musical ventures. Our set list consists of songs from the sixties onwards & includes rock n roll, soul, pop, Motown and so on basically something for everybody. So if you require a band for your pub, club or private function Chancer could be just what you re looking for.